I bought and tested this machine to do the Brother JX2517 review for you guys. Tests were run on standard quilting cotton as well as denim. 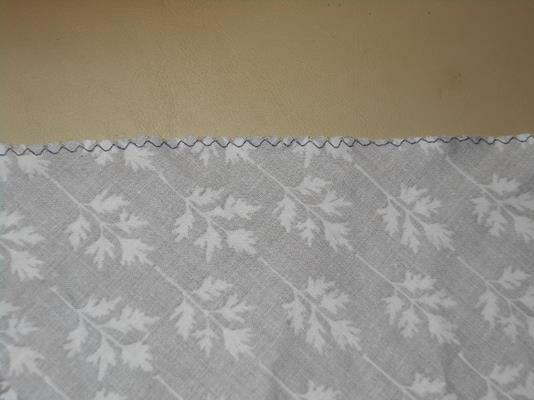 Seams had balanced tension and even stitched without skipped stitches. This was true for a single layer of lightweight cotton all the way up to 4 layers of medium-weight denim. Fabric feeds easily and evenly over the feed dogs. Sewing over pins was also no problem for the machine. 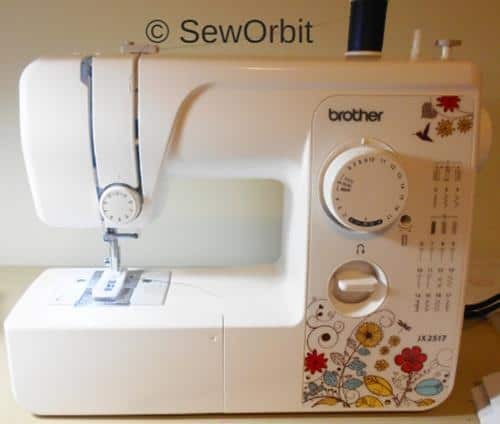 If you are looking for a lightweight, full-size sewing machine that works great for simple repairs and mending, then the JX2517 from brother might be right for you. The model is great for basic, everyday use since it comes with all the simple features and accessory you might want out of a sewing machine. What are the features of the jx2517 Brother sewing machine? Is Brother JX2517 is lightweight? Does this brother model aka jx2517 come with a LED Light? What Bobbin Features it Comes With? Can this machine sew denim? Can this machine sew upholstery fabric? Is this machine comes with extra needles? Does it come with a carrying case or a cover? How easy is it to adjust the thread tension? Does it come with thread cutter? Does Brother jx2517 sewing machine come with onboard storage? What are the different stitches offered on this model? What feet come with this machine? What are the cons of this machine? What Kind of Warranty Does Brother Offer? 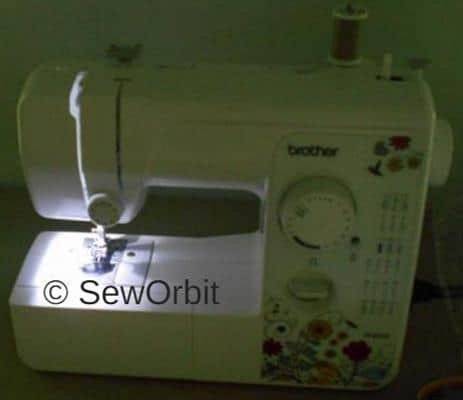 This machine was designed by Brother to be the “go-to” sewing machine for basic, commonplace uses that beginner seamstress needs. It comes with many basic accessories that you will need for most simple applications, but can also be upgraded with accessories like extra feet for greater functionality. This model is lightweight. It weighs only 12 lbs. so it can easily be stored away since it is highly portable. It is also relatively small measuring 12" H x 5.8" W x 15.3” L., so it can easily be stored away in a cabinet or closet. You can take this machine anywhere you might need it whether in a sewing room, on a kitchen table, or to work with you in front of the television. Anywhere you have a flat surface to place this machine and an outlet to plug it in, and it will work. However, in terms of portability and price Jx2517 is one of the best in the market. 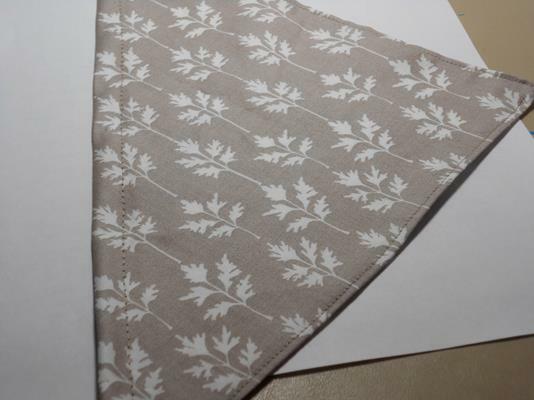 One of the difficulty sewists experience working with machines is that the overhead arm of the sewing machine casts a shadow that can make it difficult to see the finer work of the needle against the fabric. To counter this, Brother has equipped this machine with a LED light underneath the arm which shines directly on the needle and stitching area. This should help those who have trouble seeing what they are sewing beneath the upper arm. Here is the picture of this machine with Led light. First, this model makes it easy for anyone to wind a bobbin with their particular color of thread. Just place your bobbin on the bobbin winder, guide the thread through the upper part of the machine, and slowly wind your bobbin for an entirely loaded bobbin. Second, it comes with Brother’s Quick-Set top drop-in bobbin once you have your bobbin threaded and ready to use. By placing the bobbin in the machine and guiding the bobbin thread through the guide, the machine is ready for your stitches. You do not have to worry about trying to pull the lower thread up through the machine; a task that many sewists find frustrating. It automatically feeds the lower thread up through the opening, making it quick and easy to begin sewing. Third, with a translucent plastic cover over the bobbin, you will be able to see exactly when you are running low on thread. This helps you plan ahead between stitches should you need to reload the bobbin. You won’t get caught without any lower thread halfway through a stitch. Although it is super affordable and lightweight machine, it doesn't mean it can't handle denim. Just use the appropriate needle to sew denim. I sewed up to four layers of denim without any issue. I'm in love with this machine. Sorry to disappoint you on this one. I'll never try that on my machine. I just love my machine and don't want to put the extra burden on this beauty. This model comes with a needle set for fabrics of different thickness and as a backup should you break a needle. Additional needles can be ordered for a wider variety of applications. No for both the case and the cover; However, you can buy the Brother universal carrying case for this machine. Like all modern sewing machines, this model also comes with a thread tension adjuster. On the Brother jx2517 sewing machine, the tension is adjusted by a control dial directly above the needle on the upper arm. This makes it easy and convenient to set the tension on the top thread. Another nice feature that Brother has included on this model is the thread cutter. Along the left side of the upper arm is a small razor. Instead of having to reach for the scissors every time you finish a stitch, just drag the thread over the cutter for a smooth, even cut off the thread. It can save you a lot of time and hassle looking for scissors. Brother has also included a flatbed attachment that can be removed when sewing sleeves and cuffs. These kinds of stitches can be difficult if the lower sewing arm is too large to fit the ends of fabric around. And since the removable attachment is hollow, you can conveniently store all your accessories inside. That way you never have to go looking for a spare needle, bobbin or measuring tape. Brother included all the basic stitch types that any beginner would need to use in performing the most common sewing applications. While it does not have as many stitches as XR3774 has, the 17 included stitches should be able to take care of most of what the beginner would want. Six different lengths of straight stitches for use on a wide variety of fabrics and styles. These six basic straight stitches will account for most of the situations the beginner will need. Here is one example I did to test it. If you are sewing stretchy fabrics or decorative stitches, the JX2517 comes with different zigzag stitches to fit your particular need. The three different zigzag stitches are all of the same basic forms but will give you three different sizes. It turned out like this on my machine. In addition to the basic straight stitch and zigzag switch, this model also features a simple, 4-step buttonhole stitch. In an era of one step buttonhole, 4-steps to sew a buttonhole may sound a lot of work, but this fact is far from true. You will be able to sew proper buttonholes with easy four step process. And for those wanting to keep their hems beautiful and neat, this model comes with a blind hem stitch that will hide any stitches on the inside. The blind hem can be tricky and takes some time to perfect, so with a little practice on this machine. You’ll be able to master this challenging stitch. In addition to all these stitches, Brother also includes an elastic stitch, an overedge stitch, a double action stitch, and a bridging stitch. These 17 different stitches should have a broad enough functionality to please most of the beginner and intermediate seamstresses. Brother includes four basic accessory feet with this model. Two of these, the buttonhole foot and the button sewing foot will make it easy to take care of your most of the button needs. The button sewing foot will hold the button in place securely while the zigzag stitch sews it into the fabric. Also, include is a zipper foot to attach zippers to a wide variety of fabrics and zigzag foot (which is different than the button foot) for sewing in fabrics that have stretch to them. All these feet are easy to detach and attach to the sewing machine. While this is not as wide a variety of feet accessories as come with Brother XM2701 and XR﻿﻿3774; however, this should be more than enough for the beginner. You can also purchase additional feet accessories for a wider variety of applications. Most brother jx2517 reviews will not bother to tell you the negatives associated with this machine, but this machine has some issues that need your attention before you invest in this machine. Selecting the right stitch for your needs is seemed to be as simple as turning a dial to the corresponding number. Stitch selection is not as easy as it sounds. You have to play around with the dial to tune into the right stitch setting which may take some getting used to. Jumping between the last and the first stitch can be a bit of hassle. Having said that, the different stitches that this model can sew are all given in picture form on the facing side of the machine which comes in handy while selecting the specific stitch. Most of the machines from Brother do have this feature, but this machine doesn’t have automatic needle threader capability. Brother is known for its high-quality products, and their warranty shows just how much trust they have in their machines. Brother offers a 25-year limited warranty with this model. 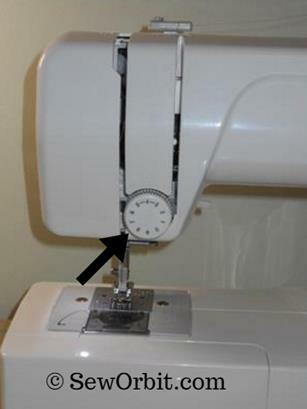 This should give you some peace of mind that this sewing machine will work for years to come! If you are looking for quality, entry-level sewing machine, then Brother Jx2517 can be a right choice to make. It comes with all the essential features that are needed for the vast majority of sewing applications. Beginners will find this machine useful and reliable. And with the quality and reputation of Brother behind it, you know it will last for many years of great sewing.